Baby Chicks will be here soon!! "An Assortment of Americana "Easter Egg" Chicks photo taken at The Natural Pet Center"
We are all very excited as this means Spring is finally around the corner! Even if we happen to have lots of snow on the ground and more on the way! This is the time of year if you have chickens already, and want to add to your flock, that you need to think about what breeds you will intergrate into your current flock. For those that are new to the backyard chicken experience and want to begin your flock then this is time to plan and prepare for those new additions to the family. Please stop by or call to place an order. We will have a large variety of chicks coming through the stores over the next few months. White, Brown, Green, Blue and Chocolate colored eggs come from different chickens. Some favorites such as Araucana (green & blue eggs) and Welsummers & Cuckoo Marans (dark "chocolate" brown eggs). Examples of Brown Egg Layers are: Rhode Island & New Hampshire Reds, Buff Orpingtons, Columbian & Golden/Silver Laced Wyandottes, Barred Rocks, Black Australorps, Speckled Sussex, Partridge Rocks, Dark Cornish, Delaware, Dominiques & Black Jersey Giants. White Egg Layers include: White Leghorns, Brown Leghorns, Austra Whites, Mottled Houdans, and Polish chickens who come in: White Crested Black & Golden & Silver & Buff Laced & White. There are also feather footed varieties such as Salmon Faverolle, Brahmas in both Buff & Light & Dark, and Cochins chickens whose varieties includes: Blue & Silver Laced & Buff & Partridge & White & Black. 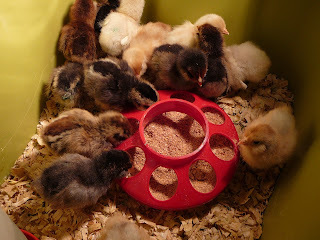 Most of the chicks just listed come in as Pullets (female) and we can order select Cockeral (males) as well. There are also the Bantam Chickens who are smaller in size to a standard chicken. Bantams come in many varieties such as Cochin, Silkies, Arauncana, and many more. All Bantams are Straight Run ONLY. All of these chicks are part of our inventory on a rotating basis during chicks season which stretches into June. These are two great links to the website from one of the hatcheries that we use. With Chick season upon us, and our first chicks ordered and arriving Friday, March 7th 2014, these are great resources: The Care of Baby Chicks and Safe Handling of Poultry both are important to you as well as to your chicks!